Use the Folding preference panel to customize the C/C++ editor folding behavior. Enable folding when opening a new editor If enabled, apply folding rules to the new editor. Select folding to use Select the folding to use from the available choices. 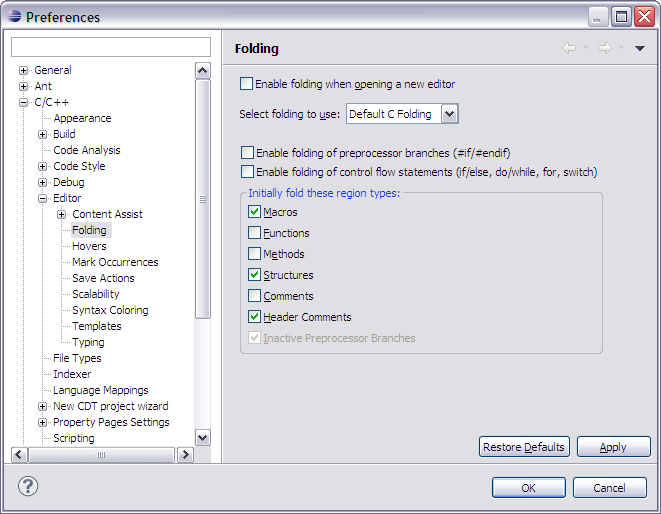 Enable folding of preprocessor branches (#if/#endif) If enabled, fold preprocessor branches. Enable folding of control flow statements (if/else, do/while, for, switch) If enabled, fold control flow statements.